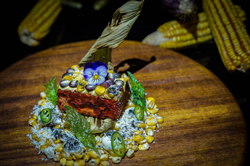 Mexico’s Velas Resorts shares a recipe for Mexican Chicken with Street Corn, one of the menu items hotel guests will experience during Cinco de Mayo weekend. The dish will be served at Frida restaurant at Grand Velas Riviera Maya while all the properties will feature special activities and menus for the holiday. Mexico’s Velas Resorts shares a recipe for Mexican Chicken with Street Corn, one of the menu items hotel guests will experience during Cinco de Mayo weekend. The dish will be served at Frida restaurant at Grand Velas Riviera Maya while all the properties will feature special activities and menus for the holiday. Cinco de Mayo celebrates the Mexican army’s victory over France on May 5, 1862 at the Battle of Puebla during the Franco-Mexican War. Velas Resorts, with luxury resorts in in Los Cabos, Puerto Vallarta, Riviera Maya and Riviera Nayarit, will offer special themed parties, tasting menus and fiestas with menu items typical of the state of Puebla. For those unable to travel to Mexico to celebrate Cinco de Mayo, Velas Resorts shares its recipe below. Combine olive oil, thyme, lemon juice, garlic, salt and pepper in a blender. Marinate the chicken with the mixture for at least 1 hour. In a pan, brown the chicken on both sides for 2 minutes. Remove from pan and place on baking sheet to finish cooking in the oven for 5 minutes. Warm the lard in a pan and sauté the bacon until golden. Add the onion, chili and epazote and cook for two minutes. Add the cheeses and toss with charred corn. Season to taste. Plate the chicken on top of the corn. All-inclusive rates include luxury suite accommodations, a la carte gourmet meals at a variety of specialty restaurants, premium branded beverages, 24-hour in-suite service, fitness center, taxes, gratuity and more. For reservations or more information, call 1-888-407-4869, email reservations@velasresorts.com or visit https://www.velasresorts.com. Velas Resorts in Riviera Maya, Puerto Vallarta, Riviera Nayarit and Los Cabos have earned 56 AAA Diamonds, including the prestigious Five Diamond Award. Other esteemed international awards for their services and facilities include Virtuoso’s “Best Spa,” Forbes’ “Coolest All-Inclusives,” Forbes’ Four Star Award, and TripAdvisor’s Hall of Fame, among others. Offering unparalleled all-inclusive experiences, properties include the AAA Five Diamond Grand Velas in Los Cabos, with dramatic ocean views and unique spaces infusing every area of the resort; AAA Five Diamond Grand Velas Riviera Nayarit, which enjoys a privileged natural setting with flowering, landscaped gardens beside a long stretch of pristine beach and a dramatic backdrop of the Sierra Madre mountains; and AAA Five Diamond Grand Velas Riviera Maya, located five minutes from Playa del Carmen, offering a sophisticated all-inclusive resort experience in the Caribbean with jungle and beach settings. In Puerto Vallarta, Casa Velas is a boutique adults-only hotel and ocean club located on the Marina Vallarta Golf Course, and Velas Vallarta, a family-friendly all suites resort and spa located on Banderas Bay. Mar del Cabo, a boutique hotel on Mexico’s Baja Peninsula, opened on December 5th as its only European Plan offering. Eduardo Vela Ruiz, founder and president of Velas Resorts, operates Velas Resorts with brother Juan Vela, vice president of Velas Resorts, by his side. For reservations or more information, call 1-888-407-4869, email reservations@velasresorts.com or visit https://www.velasresorts.com.